Signed G. W. Whitaker, lower left. Oil on Canvas. 36" x 54"
George W Whitaker, American. (1840-1916). ​​​​​​​​​​George W. Whitaker was called the "Dean of the Providence Painters". Born in Fall River, Massachusetts, Whitaker spent his student years in New York. While still in his youth, his talent was recognized by the renowned landscape artist George Inness and others associated with the Hudson River School. With this encouragement the young artist went to study in France under DePaal. There his paintings became heavily influenced by Barbizon painters of the Fontainebleau, especially the talented Francois Millet. Whitaker is mostly known for his tonalist landscapes and his regional seascapes. George Whitaker's excellence in art is equaled to his contribution to the development of a Rhode Island art community. He was instrumental in recognizing the need for an organization to nurture and support the talented artists within the state. The Providence Art Club was formally instituted by Whitaker and his friends E.M. Bannister and Charles Walter Stetson. The club provided not only a formal association with fellow artists but a public forum in which to present his work. E. M. Bannister executed this painting "Under the Oaks" which was exhibited at the Philadelphia Centennial Exposition of 1876. Bannister's painting won a first-prize medal at the exhibition, making him one of the best-known painters in New England and the first African-American artist to win widespread acclaim. The Bannister painting remains unlocated to this day. E. M. Bannister died in 1901. A Memorial Exhibition of 101 of Bannister's paintings was mounted by the Providence Art Club in May of that year, with numerous paintings being loaned from the private collection of many artists of the day, including George Whitaker, who loaned five large scale canvases to the exhibit. According to George Whitaker, Bannister's "earliest works were scriptural scenes. Later, he drifted into landscapes, with figures and cattle as accessories." 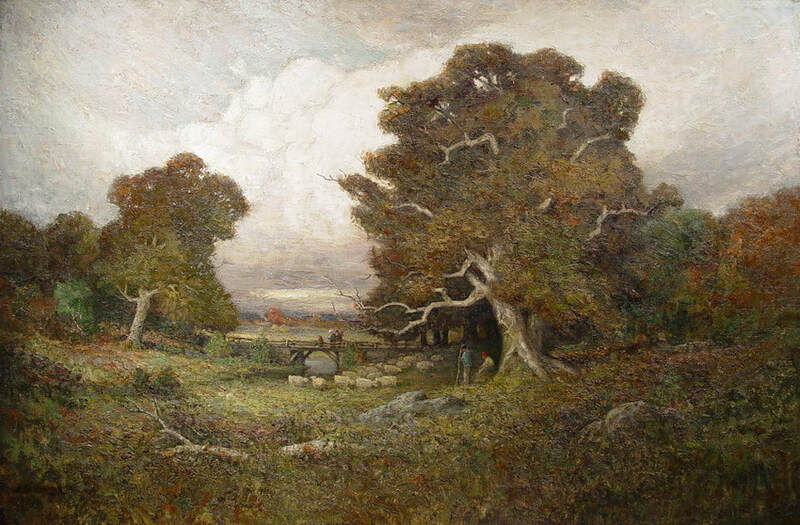 In 1903, two years after the death of E. M Bannister, George Whitaker completed this large scale landscape painting Under the Oaks which may be related to the award winning painting of the same title executed by E. M. Bannister twenty seven years earlier. This represents an extraordinary effort by George Whitaker, for not only is the painting executed in large scale, but the meticulous addition of people as well as numerous sheep creates a scene that Whitaker seldom was ever able to capture. Whitaker's largest scale canvases are typically still lifes, and his landscapes seldom include people, or animals for that matter. Stylistically, this painting parallels many of E. M. Bannister's works from the 1870's - 1880's period, including Approaching Storm, 1886, o/c 40x60 inches, and Landscape with Man and Horse, 1884, o/c 26x40 inches. Title alone also relates this work to the famous Edward M. Bannister painting Under the Oaks which was exhibited at the Philadelphia Centennial Exposition of 1876. Though research is ongoing regarding George Whitaker's true intention in creating his painting Under the Oaks, the date (1903), its large scale execution, and its title all indicate that this painting may have been a personal tribute by Whitaker to his recently deceased friend.